September always makes me feel a bit conflicted. I love autumn but on the other hand it means the end of summer and that winter is coming… Luckily there are a lot of great events going on this month to motivate you to go out and have some fun! I have selected a great fashion event, because September always feels a bit like a shopping month to me. This Sunday you should really go to De Wasstraat (‘carwash’ in English) at De Ceuvel. And no, you can not wash your car here, De Wasstraat is the name of a clothing swap. The previous edition in May was such a great success, that they decided to host another edition this fall. Do you have a closet full of clothes but it still feels like you have nothing to wear? Or maybe you bought some stuff, that in hind side is not really your thing? I know I have. Then it’s about time to thoroughly clean out your closet. 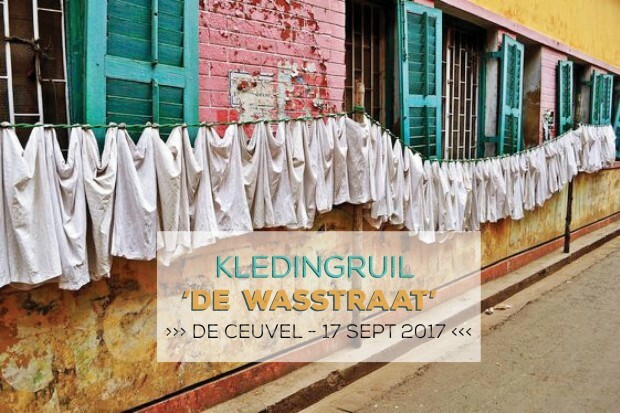 Collect your most beautiful clothes that no longer fit you or your style and exchange them for new favorite pieces during De Wasstraat! Why buy new items if you can trade? Bring at least three and up to seven pieces of beautiful clothing. Shoes, bags and accessories are also welcome, no lingerie. For each delivered item you will get a voucher that lets you find one piece. The jury determines at the entrance whether your pieces are still good enough to make someone else happy and give you a voucher indicating how many pieces you can take home. I’d hate to state the obvious but make sure your clothes are washed and clean, without any holes and stains. After De Wasstraat you can see the documentary The True Cost during Greendoc. A documentary about the impact of the fashion industry which is a must see for everyone. Hot tip! If you’re into conscious fashion, you might also like LENA, a fashion library which you can find at the Westerstraat and since recently online as well. Want to read about more treasures and the hidden spots of Amsterdam? Have a look at Schatzoekers Amsterdam!